Christmas time is all about good food and being with the ones you love. 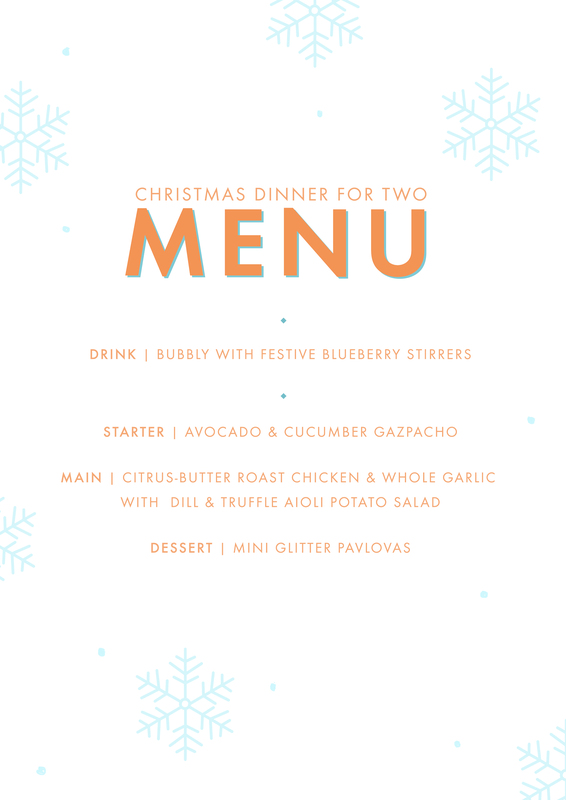 We know that not everyone has a stampede of an extended family and some of us prefer a quieter more intimate festive season, which is why we put together our take on a Christmas Dinner for Two. 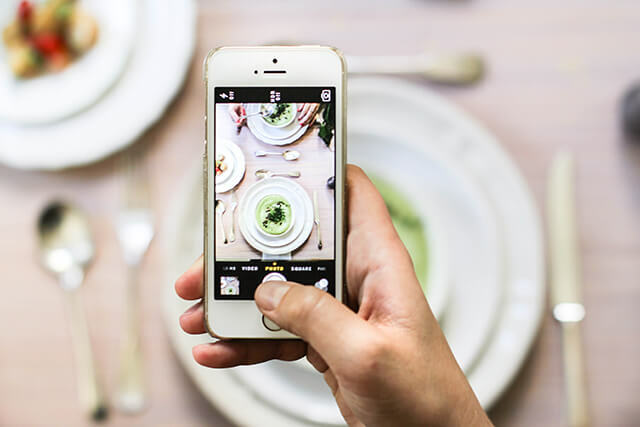 To recreate this totally gorgeous setting we’ve done the hard work for you and shared our menu and recipes with you. If you’re entertaining for more than 2 people, simply double the amounts. This dish can be prepared the day before and kept in a sealed container in the fridge or enjoyed immediately. Add the avocado, cucumber, water, yoghurt, lemon juice, chives, dill and salt to a blender. Blend until the mixture is completely smooth – season to taste. 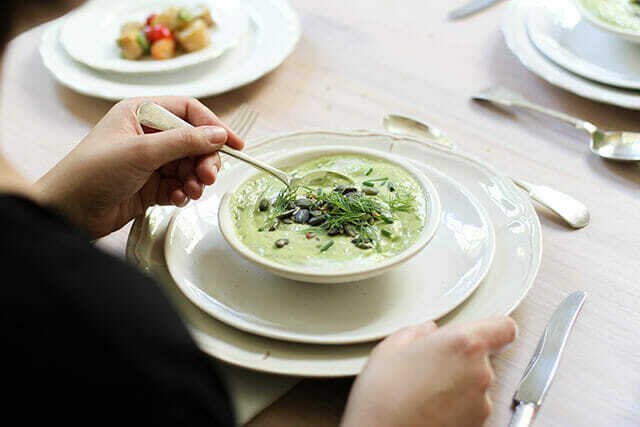 Serve in glasses or small bowls with a drizzle of olive oil, toasted pumpkin seeds, a sprinkle of chopped dill and chives and some freshly milled black pepper. Chicken is always a good option if you want something yummy that won’t break the bank. 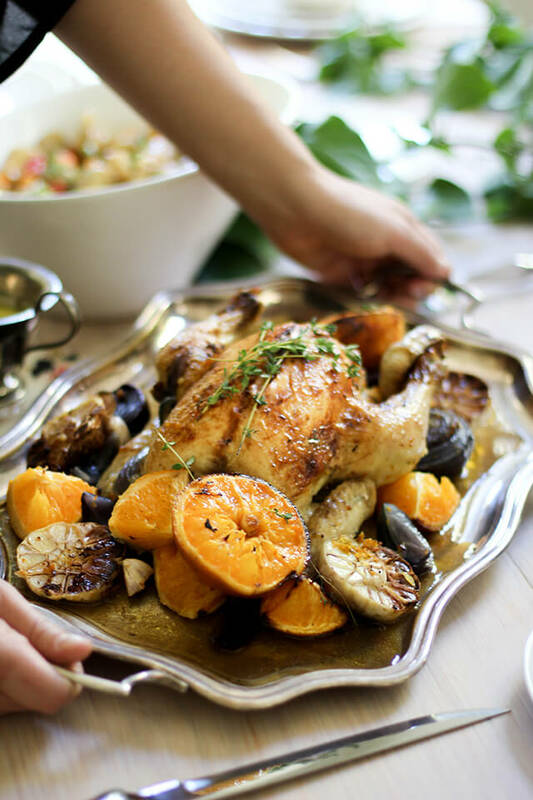 This recipe, instead of using lemons, adds the citrus dimension with oranges, making for a sweeter roast. Preheat the oven to 230°C. Gently rinse your chicken and pat dry. Using the blade of a broad knife, mash the clove of garlic and coarse salt into a paste. Combine the paste, softened butter, orange zest and chopped thyme. Carefully separate the skin from the breast of the chicken and rub half of the butter mixture under the skin. Season the outside with some salt. 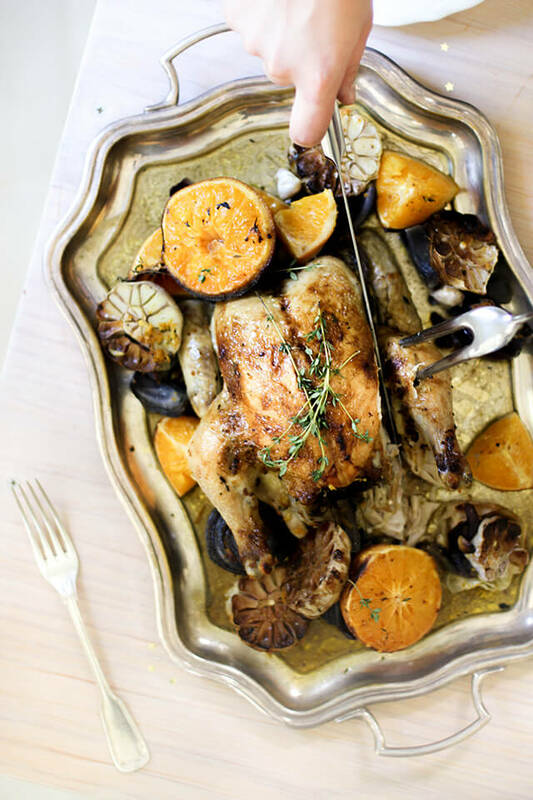 Fill the cavity with 3 orange wedges, an onion wedge and thyme sprigs and place the chicken breast side up in a roasting pan. Scatter the halved garlic bulbs and remaining orange and onion wedges around the chicken, dotting a tablespoon of the butter mixture over them. Place the chicken in the oven and roast for 30 minutes before removing and brushing with the remaining butter mixture. Turn over the oranges and onions and roast for another 15 minutes. If the oranges and onions have caramelized remove to avoid burning and roast for a further 15 minutes. Remove from the oven and let the chicken rest for 10 minutes before carving and serving. Who doesn’t like the stuff? 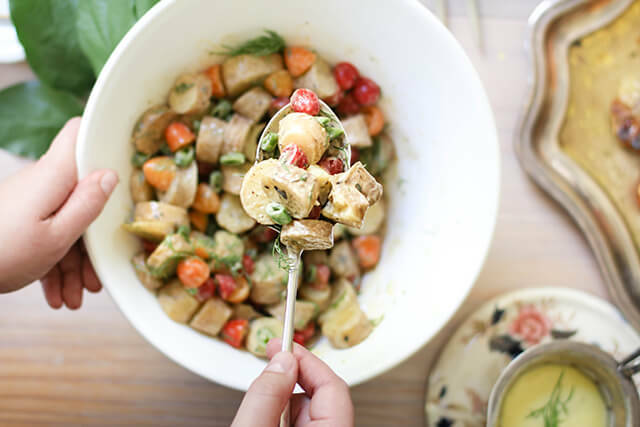 This version has a bit more of a festive flair than your run of the mill potato salad. Place the potatoes in a small pot with just enough cold salted water to cover. Bring to a boil then reduce to simmer for 15 minutes. Drain and set aside to cool. Once completely cooled, halve the potatoes. For the aioli, drape a kitchen towel over a small saucepan and set a small metal bowl over (this will keep the bowl in place while whisking). Mix the canola and truffle oil into a cup. Whisk the egg yolk, garlic, salt and water until well blended. Whisking constantly, slowly drizzle in the oil mixture, one teaspoon at a time until the sauce starts to thicken n emulsify. If the sauce begins to separate, stop adding oil and continue whisking. Slowly, in a steady stream, continue to add the rest of the oil. Once incorporated and your sauce is nice and thick, stir in the lemon juice and black pepper. In a large serving bowl, combine the tomatoes, peas, dill and cooled potatoes. Pour the aioli over and toss with your hands until well coated. 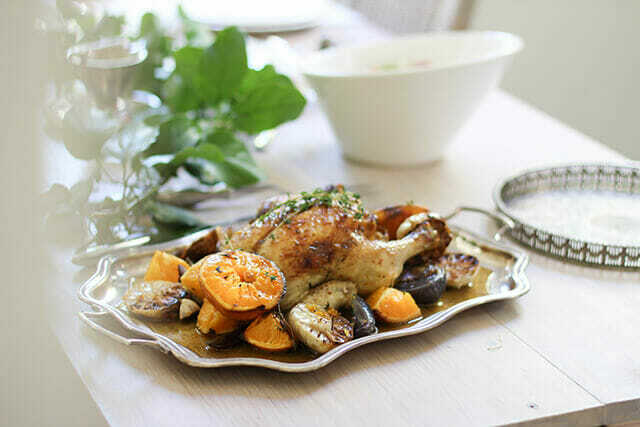 Serve with your citrus-butter roast chicken. 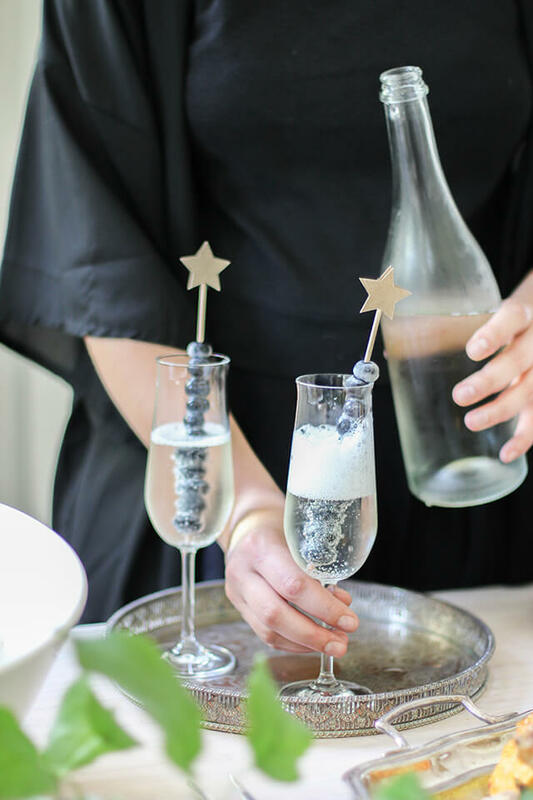 We are obsessed with edible glitter. 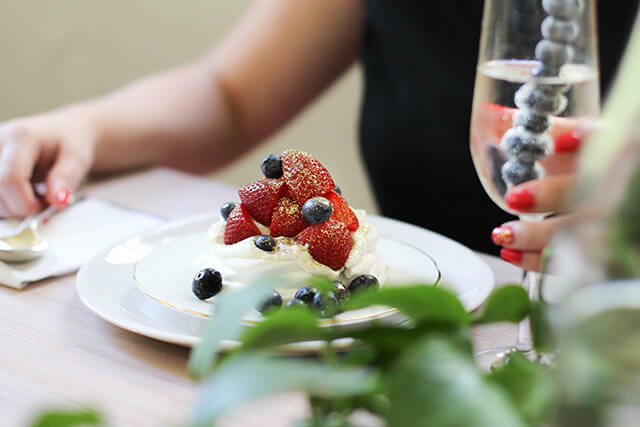 So much so we had to refrain from putting it on the roast chicken and save it for the star of the show – Pavlova of course! The meringues can be made the night before and stored in an airtight container in a cool dry place. Place the egg whites into a clean bowl and, with an electric beater, beat until soft peaks form. Gradually add the caster sugar whilst continuously beating, until the mixture is thick and glossy – this will take about 5 minutes. Fill a piping bag fitted with a large nozzle with the meringue mixture and pipe 4 10cm rounds onto the baking paper. 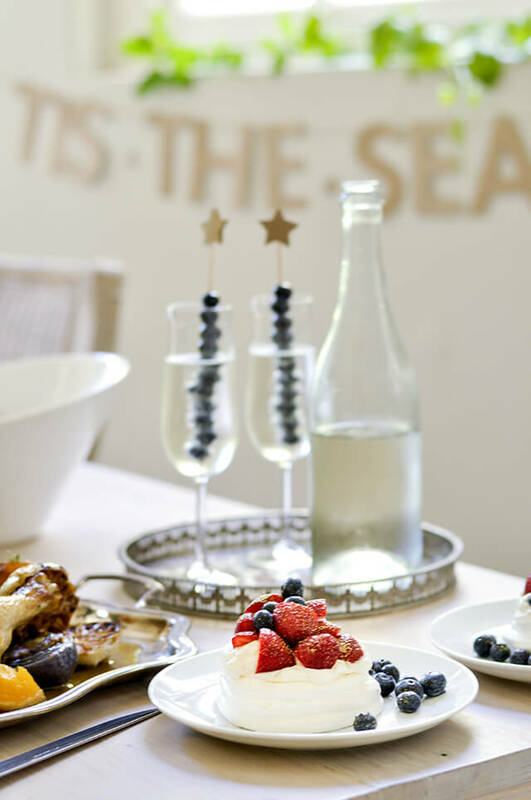 Make sure you pipe a edge around each round to create a meringue ‘basket’. Place the baking tray into the oven and bake for 20-25 minutes, until crisp. Cool completely in the oven with the door ajar. 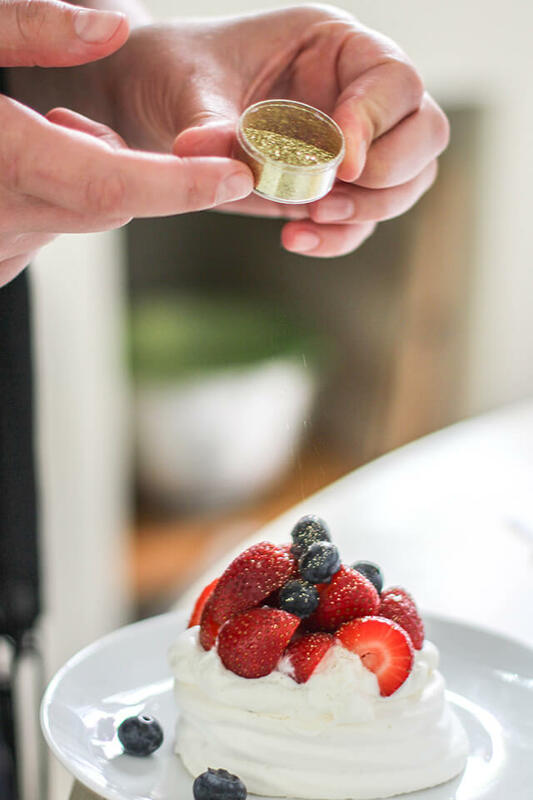 Top each meringue basket with whipped cream, strawberries, blueberries and a generous sprinkle of gold edible glitter. Serve immediately. 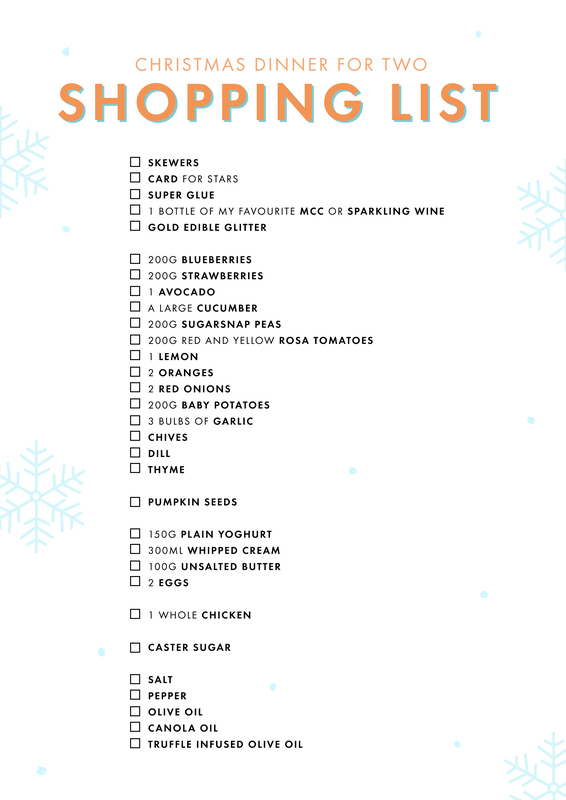 To make things easier, we even made a shopping list for you to print and take along to the shops! 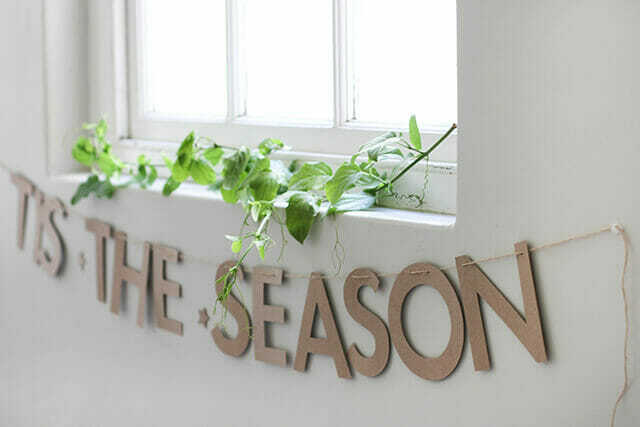 Keep your eyes on the blog this week for some DIY’s from this shoot. 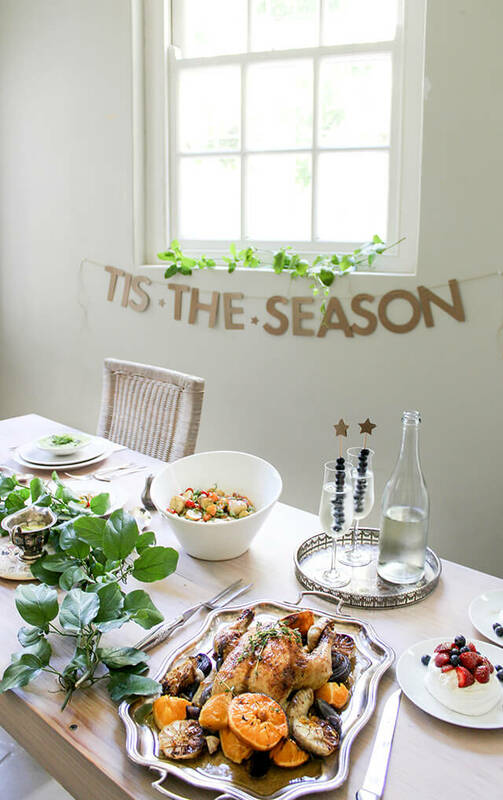 We hope you are inspired to put together the most unforgettable festive feast yet! Such a merry menu! I am definitely going to do this!